So guess who gets DVDs by mail now? This girl! Two weeks ago Modern Times (1936) blew in through the post, along with Bridesmaids (I tell you I watch everything). 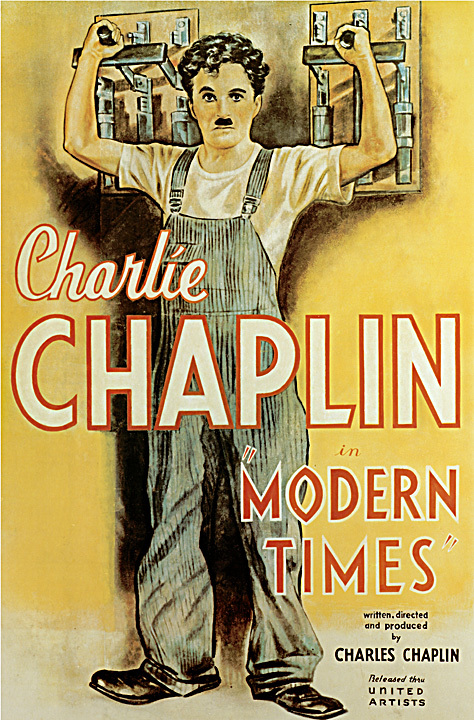 Modern Times was Chaplin’s first sound film — the 1940 film The Great Dictator his first “talkie”, which interestingly, he swore he would never make. In 1936 it seems he hadn’t reconciled himself to the advent of talkies. Except for a scene in which Chaplin’s Tramp entertains a cafe audience by singing complete gibberish, he says not a peep. Narration and dialogue occur mainly on intertitles. It’s also my first exposure to Chaplin’s work — don’t judge, internet. Can I be honest here? All that his name brought to mind before this was a goofy tramp with a tiny mustache. Modern Times changed that. The clarity! Paulette Goddard’s first scene stunned me. Her character, so joyous, so alive as she scrambles along the docks to survive, gritting her teeth against a sharp knife — and life. The satire and humor! It’s impossible to pick a favorite scene from this film. 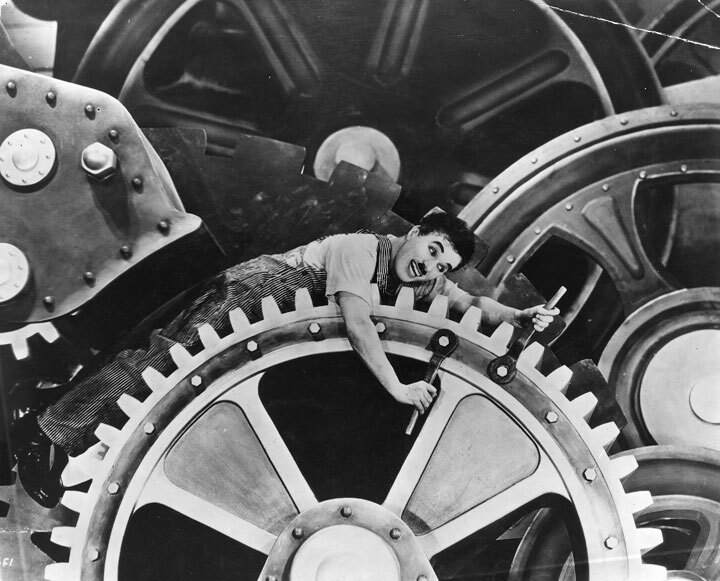 Among the many is when Chaplin, on the verge of a nervous breakdown after working on a production line, goes on autopilot and attempts to tighten the secretary’s skirt buttons with his wrenches. Or how about after he falls into the cogs? Or when the mechanic falls through it? And who can forget the American daydream house where grapes grow around the kitchen door and cows walk up for milking? It’s not all laughs, of course — they live in the midst of the Great Depression. Tragedy comes in the form of a bread line. The tramp alternately lands in jail and gets fired. Life fights dirty and they fight back — often ending up on the losing side — but they try. I was excited watching this film. Excited, frustrated, saddened, amused. I could relate to it in different ways — many people can. But the main feeling threading its way throughout the film? Hope. “Buck up — never say die!” the tramp tells “a gamin” as they sit, homeless and exhausted, along the side of a vast, empty highway. She does … and we do too. This entry was posted in Entertainment, Films and tagged 1936, A Gamin, black and white, Charlie Chaplin, film, Great Depression, Modern Times, mustache, Paulette Goddard, silent films, sound, Tramp by Jasmín. Bookmark the permalink.